geProductKeys Finder is no longer available for download through the link below. If you have an alternative link available, please let us know. You can find other free product key finders in this list of key finder programs. 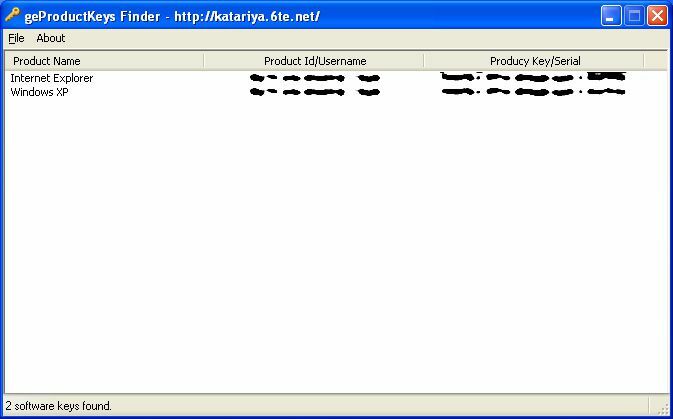 geProductKeys Finder is a key finder program that shows product keys for Windows, a few Microsoft Office programs, and some other software. The program looks nice, is portable, can export keys to a file, and keeps the information well-organized so it's easy to read. Please read my Key Finder Programs FAQ for more information on key finder programs in general. This review is of geProductKeys Finder v1.0. Please let us know if there's a newer version we need to review. geProductKeys Finder is definitely one of the more easier key finder programs to use. Information is displayed as soon as the program launches, which means you don't have to click any buttons to run a registry scan. It's too bad geProductKeys Finder works for only a few programs. This means you'll need something more exhaustive like License Crawler or Belarc Advisor to find keys or serials for other software. However, if you just need to find the product key for Windows XP or a few other Microsoft programs, I think geProductKeys Finder is a nice choice. You may have to disable Data Execution Prevention to use geProductKeys Finder in Windows XP SP2 and later. Didn't find what you were looking for with geProductKeys Finder? Try a different free key finder program or maybe even a premium key finder tool.